Even if you’ve never played online slots before, chances are that you’ve already heard of Bonanza; a slot we are all too proud to feature at Amigo Slots! The online slot which was released back in 2016 is still the second most popular online slot game currently played in the UK according to Slot Catalog. The only online slot which beats Bonanza in terms of popularity is Starburst. Yet, there are literally worlds apart from the two online slots. We will do our best to run you through just what has made Bonanza so popular, but for a real taste of how fast-paced the reels are you’ll definitely have to check out all of the action for yourself. You’ll be able to try the online slot for free before you play for the ability to win real cash, and you might just want to sit down before you find out just how much cash is up for grabs from the 6 reel slot which brought Big Time Gaming up to the standard of industry leaders. Bonanza carries a mining, jewel, and North American theme which will give you a little taste of just what life is like amongst the granite as miners go in search for jewels and gold. The game has a slightly anachronistic feel to it which transports you back in history when it wasn’t uncommon to find people with picks in hand as they hammered and chiselled their way to riches. Thankfully, what you will have to do to find a significant win with Bonanza will take far less manual labour. You can even play Bonanza in the auto spin mode! Admittedly, you may have a bit of a hard time relaxing with just how hard hitting the action with Bonanza really is! If you’re serious about HD graphics, you definitely won’t be disappointed with Bonanza. It is not only the reels themselves which will visually take your breath away. The charming background is effective in setting the scene to further intensify the gameplay experience. On the left hand of the reels you will find a wooden log cabin which is hanging precariously from the edge of the mine (given that the symbols explode and cascade on the reels, we definitely wouldn’t recommend living there). On the right hand of the reels you will be treated to the cathartic sight of an old fashioned water wheel spinning, yet, even if the water wheel was placed in the rapids, there’s no way that it could keep up with the speed of the reels. When we say reels, they are reels in a very loose definition of the term. As the perfect online slot for you depends on your budget and what you are looking to get from the online slot in terms of bonuses, free spins, and jackpot amounts, not every online slot is perfect for each player. Bonanza was developed as a game to suit those with a medium to high budget to play with. As you are able to place a bet anywhere up to £500 high-rollers will definitely want to take advantage of just how much they are able to place down on each spin. For those who are looking to play at the lower end of the betting range, the minimum stake amount is set to 20p. Another feature which makes Bonanza perfect for those looking for a major cash jackpot is how many different ways to win there are. Prepare yourselves for this stat, because there are a whopping 117,649 different ways to in on the Megaways online slot. Considering that most online slots only offer up to a maximum of around 200 different bet lines, that’s a pretty big deal!! So just how does an online slot offer so many bet lines? This is due to the clever patented technology behind Megaways games. Gameindustry.com have predicted that online slot players will get to enjoy the rise of the Megaways slots in 2019. In every definition of the term, Megaways games are game-changers. The technology was first seen in Big Time Gaming’s 2016 game Dragon’s Born before it was incorporated into Bonanza. The technology system allows the 6 reels to contract and expand with every spin. This means that you may see as few as two symbols on the reels or as many as seven. The 8 x 8 x 8 x 8 x 8 x 7 slot game set up may sound a little overly complicated yet you’ll have a firm grasp of the gameplay in no time at all! Just look out for the symbols matching adjacently. Warning: once you try out the Megaways systems you may never want to go back to normal online slots ever again! As we previously mentioned, the reels don’t work like traditional reels like you would find on a land-based slot machine. Instead, once you have matched symbols, they will then be demolished, and fall off the screen as little more than dust. For every symbol which has dropped off the rock face another symbol will fall from the top. If the new symbols which have just landed strike a new wining combination, then these symbols will also fall. There is the potential to get plenty of wins this way. However, when no more combinations can be made on the reels you will need to press spin again. If you’re thinking right now that Bonanza sounds like one of the best online slot games to watch go through the motions you’re absolutely correct. The HD 3D animated slot is amongst one of he most impressive out there to date. Even Big Time Gaming has struggled when it comes to matching what they have created with Bonanza! Of course, no review of Bonanza would be complete without mentioning the music behind the online slot. If you’re a fan of Hillbilly music, (I know the chances of that are slim), then you’ll love what Big Time Gaming created with the soundtrack. Hell, even if you’re not a fan you’re sure to appreciate the lively and concordant music which plays every time you put the reels in motion. You’ll certainly know about it when you win as you hear shots fired. The sound of the coins being deposited to your coin balance can also be described as pleasant. The symbols on the reels will appear as bright colour gems, which come alongside the low value letters. However, it is not just the symbols which are on the reels which you will want to watch. On top of the 6 reels, you’ll see 4 more, symbols which provide you with the increased possibility of wining. Now, lets move on to the exciting bonus features offered by the iconic slot! Big Time Gaming left us plenty to go over when it comes to the bonus features on the online slot. Of course, for many players bonus features aren’t the be all and end all when it comes to online slots, but for those who love the prospect of free spin, generous multipliers, wilds, scatters, and bonus games they can really amp up the excitement. The game developers at Big Time Gaming must have been feeling pretty generous when they decided to include so many bonus features in Bonanza. The Wild Symbol: Sticks of dynamite will serve as the wild in Bonanza. Landing a stick of dynamite on the grid will replace the other symbols apart from the scatter symbol. The Scatter Symbol: The scatter symbol is the GOLD symbol. If you see four scatter symbols on the reels, you’ll receive twelve free spins and enter into the bonus round! If 12 free spins don’t sound all too impressive, you’ll have the chance to win more free spins! Every time you find another scatter symbol in this round you will be given five more free spins. This will carry on until you’ve ran out of free spins on this round. Multipliers: After each explosion on the reels in the you will be awarded with a 1x multiplier, for every winning combination after this the multiplier will increase by another 1%. While you are increasing your multiplier amount, if you see three wild symbols in the carts at the top of the screen, you’ll automatically be awarded five free spins. If you see four wild symbols you will be given ten free spins. Thanks to all of the fun features offered by Bonanza, the online slot has been rated as a high volatility slot. Not only will you receive frequent wins, the wins which you do experience will be fairly substantial! For those who are disappointed that Bonanza isn’t set up with a progressive jackpot; don’t be. You’re able to win anywhere up to 120,000 coins. Which is a nice boost on your original stake amount of 10,000x. The highest jackpot win is possible through the free spins feature which also allows your multiplier amount to rise. There aren’t many people in the online gambling industry who aren’t excited about the in-house talent and just what they can cook up with their access to such impressive technology systems. Big Time Gaming first established in 1996 and while they may not be the oldest gaming company, they were certainly prepared for the digitalisation of land-based gambling. As the Megaways technology is only utilised by Big Time Gaming at this point, there are only Big Time Gaming games which offer such a high number of bet ways. Yet, there are still a few more titles which carry the same charming theme as Bonanza with a more traditional online slot set up. We’ve hand-picked the top slots which we are sure that fans of Bonanza, or those who are looking for an alternative will appreciate. Extra Chilli Online Slot: Extra Chilli operates with the same Megaways technology as Bonanza, so, the high amount of bet lines will remain the same, as will the exploding and cascading of the reels which comes with the multipliers. Yet, there is still a far amount which sets Extra Chilli apart, this include the lower maximum stake amount of £50, yet, you can get a 20,000x multiplier by playing! Temple Quest Spinfinity Online Slot : Temple Quest Spinfinity was a 2017 release by Big Time Gaming who kept the Megaways tech away from the game to offer a med-high volatility game which offers only 40 bet lines with a more than generous RTP of 96.17% while that may all sound a little unimpressive after we’ve disclosed the amount of bet lines and maximum jackpot amounts with Bonanza Temple Quest is still a great game for is simplicity. Temple Quest also comes highly recommended to anyone wanting to bet with low stake amounts. The prospect of winning the 3750 coin jackpot isn’t all that unimpressive after all! Temple of Fortune Online Slot: If you liked mining and getting amongst the rubble with Bonanza, Temple of Fortune is yet another stellar release from Big Time Gaming. The online slot was released back in 2015 and is the perfect alternative to both Bonaza and Temple Quest Spinfinity. Temple of Fortune treats you to the simplicity of a 5 x 3 reel slot with 20 bet ways, but it also comes with the added bonus of being able to win 250,000. Diamonds Online Slot: There is definitely no blood on the diamonds which are found in Big Time Gaming’s slot machine. It may be one of their oldest titles but you can get the sense that what they created with the Diamonds online slot paved the way for the ingenious creation which was Bonanza. It was 2013 when Diamonds was released and first offered players a chance to win the 400,000 coin max jackpot. Just as with Bonanza, you’re not treated to a normal reel set up, instead the reels feature over a 4 x 3 x 4 x 3 x 4 grid. Yet you don’t get as many different bet ways to play with, there’s only 40. But who knows, the lower number of bet lines may be of benefit to some players. If none of Big Time Gaming’s creations quite tickle your fancy, there are plenty of other games which pay an ode to the landscapes of Northern America before it was transformed to how we recognise it today. Railroad Express Online Slot : Railroad Express is one of Old Skool Studios biggest games. The 5 x 5 medium variance slot offers 5 different bet lines which may lose a fair few fans, but with the number of bonuses and the progressive jackpot, there are still plenty of pros to playing the online slot. With a jackpot amount of 150,000 coins and a RTP of 95.19% Railroad Express is a fairly decent all-rounder online slot. Jewel Quest Riches Online Slot : Old Skool Studios has made their second entry onto the list with their 2017 game Jewel Quest. 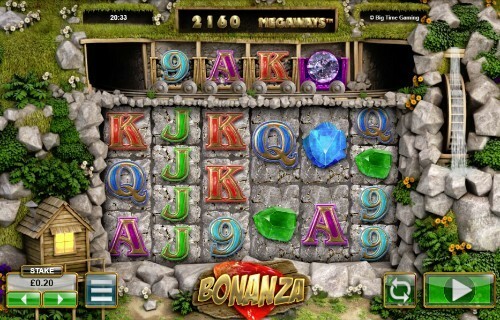 The game boasts some game-changing multipliers and the same jackpot size and return to player rate as Bonanza. For anyone who like the cascade style set up, Jewel Quest is definitely a safe choice which employs a more standard set up across the 5 x 5 reel grid. Greedy Servants Online Slot: Spinomenal may not be the biggest name, but with their uniquely charming online slot Greedy Servants they have created a noteworthy addition to the world of archaic slot machines. With a nice 97.2% RTP on the 5 x 3 reels you will have 30 different ways to make a winning combination. Yet, the real selling point of Greedy Servants is the amount of bonus features paired with the stunning and highly visual graphics. Given Bonanza’s popularity, it should be no surprise that Bonanza is a brilliant game to play whether you choose to play on your mobile, tablet, and desktop or tablet. As we’ve already stated, the graphics on the Bonanza online slot go beyond what most people expect, so depending on the model of your phone, it may have a little trouble keeping up with the gameplay experience. Yet, any Apple or Android smartphone which is able to easily support HTML 5 games will have no problem keeping up with the graphics. As great as Bonanza is to play on your mobile, to be treated with the best experience, you’ll want to spin the reels on the biggest screen possible. That being said, if you are just playing for the tidy jackpot amounts, then it won’t make much of a difference wherever you choose to play! As we previously mentioned, Big Time Gaming released Bonanza back in 2016, however, it wasn’t until 2017 that online slot players across the world really started to appreciate what Bonanza and the Megaways had to offer. Here’s what the CEO of Big Time Gaming had to say about the innovation which went into Bonanza along with their other perpetually-popular online slots which includes Extra Chilli and Who Wants to Be a Millionaire. Along with still being the second most popular online slot at the time of writing this review, the online slot also enjoyed plenty of popularity in 2017 when it was listed amongst the most highly played games by Casinobeats.com.